Add sophisticated sparkle to your look, with this pretty pair of 3mm crystal stud earrings in a chic sterling silver champagne glass shape setting. Designed to reflect the light beautifully. 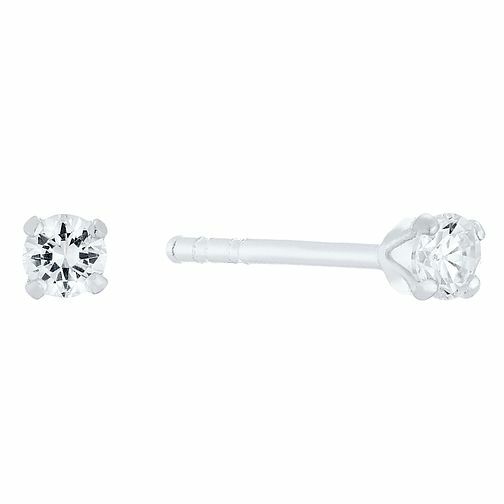 Sterling Silver 3mm Cubic Zirconia Stud Earrings is rated 4.5 out of 5 by 11. Rated 5 out of 5 by Anonymous from Just what I wanted These earrings are tiny and very sparkly - just what I wanted. Very pleased with them. Rated 5 out of 5 by Anonymous from Beautiful Earrings! Beautiful earrings! Wear them daily and have recieved so many compliments. Definitely recommend buying these!